Amitostigma is a genus comprising about thirty orchids, native to mountainous areas of Asia. 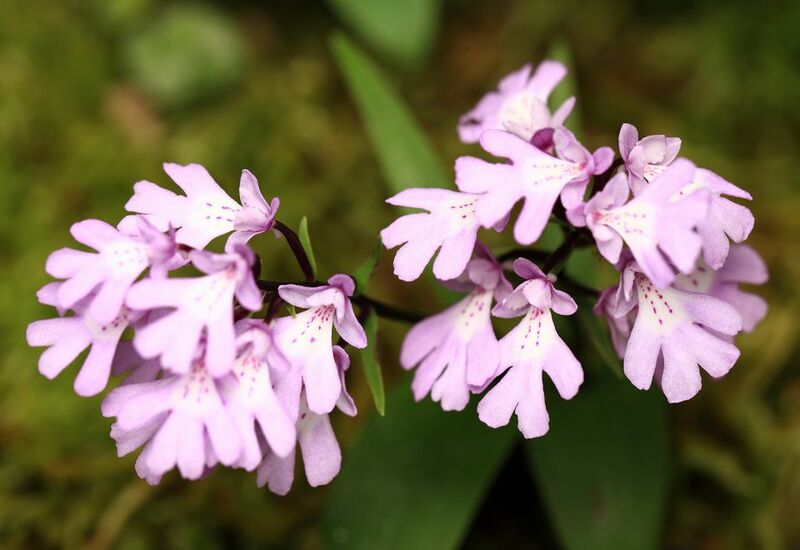 Most commonly found in China, Amitostigmas are well-acclimated to high-altitude conditions as well as low temperatures, and are fairly hardy for orchids. They’re terrestrial and typically very small, only a few inches in height. They grow flowers from their inflorescences, and these flowers vary in color – in fact, they can even vary while on the same plant. These plants are perennials, which means that they lose their leaves and flowers for a long period each year before regrowing them during the growing season. Therefore, they’re best suited to a hot, dry summer, in which they’ll be dormant and fail to sprout new growths. Since these orchids are typically found only in alpine regions of China, they’re rare in domestic cultivation and you’d likely have to resort to a specialty source to get your hands on a specimen. But they do possess aesthetic advantages nonetheless, despite their small size, as varieties like A. capitatum have creamy white flowers with a pleasant, muted look. Amitostigma was defined as a genus about a hundred years ago by the famed botanist Rudolf Schlechter, whose work was concentrated on exotic Asian orchids. Now, despite its rarity, this genus is still popular among aficionados of Far Eastern orchids. Light: Partial shade or dappled sunlight is best. Watch out for leaves turning pale or showing odd discolorations, which can mean the plant isn’t receiving enough light. Water: Water regularly during the growing season in fall and winter and then scale back its water for the dormant season in summer, which should be hot and dry. Temperature: Amitostigmas tolerate wide swings in temperature and are acclimated to the cool temperatures of the mountains as well as the heat of the Chinese summer. Soil: Make sure their drainage is good. Soil with some organic material typically spurs on growth. Fertilizer: Feed regularly with a balanced, diluted fertilizer like a 20-20-20 for best results and scale back their feeding during the summer. These tuberous plants can be propagated by separating an inflorescence at the beginning of the growing season in fall and replanting it in warm, moist soil. Many gardeners bag up their plants to seal in moisture and warmth, thereby increasing the chances of survival. Always try and use sterilized tools when dividing plants to decrease the Amitostigmas’ risk of contracting disease. These terrestrial plants typically won’t need repotting, but if you do choose to grow them in containers it won’t hurt to make sure their soil stays fresh. Lift the orchid out and place it in a container of comparable size, then backfill it with potting soil. Amitostigmas are small enough that they shouldn’t overrun their containers unless the containers are unduly small. Though these plants are typically found in China, some of the most beautiful varieties are actually more commonly located in other parts of Asia; for instance, A. lepidum, which is found on the Japanese mainland and the Ryukyu Islands, has wonderfully spotted purple flowers with a delicate look. Some of these plants, like A. yuanum, are endangered or threatened in their natural habitat. You probably won’t be growing these rare Asian orchids regardless, but if you come back from a trip to China with one lodged in the bottom of your shoe and decide to cultivate it then you shouldn’t find it to be too much work. Amitostigma plants are tough enough to survive the harsh conditions of high mountain ranges, which is somewhat unusual for orchids. Keep them wet and well-fed and they should be just fine.